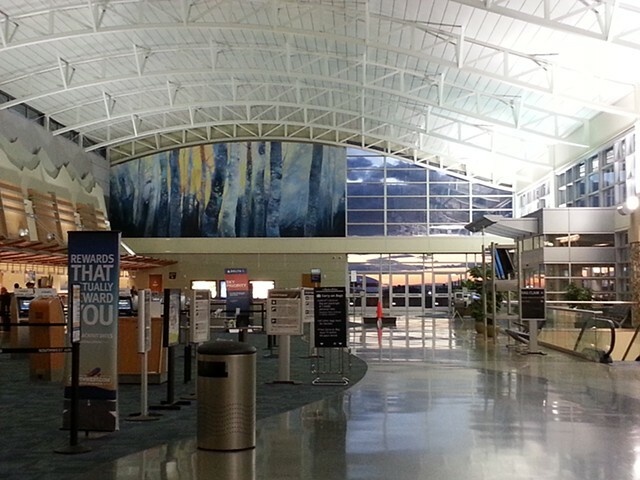 I am proud to present my Boise Airport Mural, Along The River's Edge. I was selected during a national search. The mural was commissioned by the Boise City Department of Aviation to commemorate Boise’s one-hundred-and-fifty year anniversary. This public art project was administered by Boise City Department of Arts and History. Fabrication and installation was completed by Catapult 3. I would like to sincerely thank all of the previously mentioned individuals that helped bring my vision to fruition. This painting is dedicated to the people of Idaho and all of the fortunate travelers visiting our beautiful state. As the daughter of a fly fisherman, I have spent countless hours on the thicket laced banks of every Idaho stream or river suitable for fishing. These rivers and woodlands have called people to live along its route in this high desert land of Southwest Idaho for the past one-hundred-and-fifty years. The Boise River has a profound influence on community, environment, and enterprise. This painting is inspired by nature and yet provoked by my past and present memories of extraordinary time spent along the river’s edge. Thank you for visiting my website. The portfolio contains images of past and present work. You may continue to double click and gain a larger screen image of the paintings, enjoy.